When it comes to your IT, things can get pretty confusing pretty quickly. When things go wrong your first instinct is to get someone in to fix it, but do you stop and ask yourself why did it stop working in the first place? Having a break-fix scenario can cost your business thousands of dollars. That is money that you could be investing in an effective IT strategy instead. You know what it means to have great IT support: you have a responsive and reliable team that helps your business with all their tech-related problems. But how do you plan to prevent those problems in the first place? 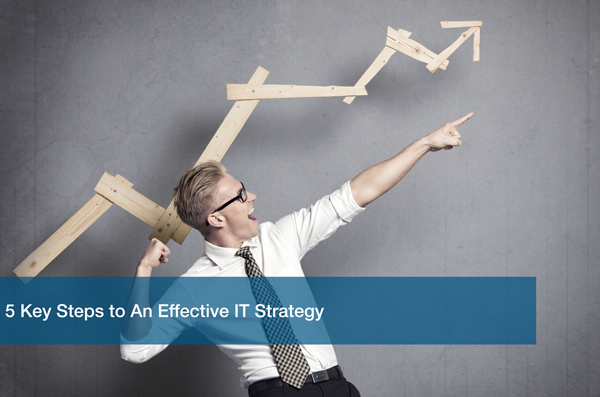 The first step to take would be to review your current IT strategy. This means reviewing your current setup and tech. Is your equipment a little outdated? Do things need to be replaced? You can’t start unless you know what you have. Perform an IT analysis of your current tech so you know in what direction to go to be more effective. Where do you want your business to be in 6 months? 12 months? How do you want to get there? Having the right tools and equipment can improve your efficiency and productivity at work. That is why reviewing your current setup is important. You can see if your current equipment is going to help you accomplish your goals, or if you need to take a different direction to get there. This is a big one. This is where the investment comes into play. We’ve already established that fixing things when they break can cost you thousands of dollars. Temporary solutions are not the answer when it comes to tech challenges. Once you have mapped out your goals, it’s easier to see if your budget can actually get you there. You can start adjusting your plan along with your budget to better balance out your spending. We know all this sounds like a lot of hard and tedious work. Wouldn’t it be great if you could just hire someone to do all this for you? Well you’re in luck! That’s exactly what an IT partner is! They help conduct IT analyses to find the right path for your budget and your business. You don’t have to worry about knowing all the technical terms or knowing about software upgrades and whatnot. An IT partner can help determine exactly what you need to accomplish your goals. This might all sound fantastic, but nothing is going to happen if you don’t get started! You can plan all you want and conduct reviews, but if things don’t move along, then you’ll never accomplish your goals. It doesn’t have to be a drastic change. Slow and steady, as long as it’s steady, will get you there! Ready to get started? Sign up to qualify for a Free IT Analysis to take the first step to an effective IT strategy today! !